As a child of the 80’s, I loved heavy metal music. Heavy metal is way less cool, however, when it’s found in your kid’s drinks. 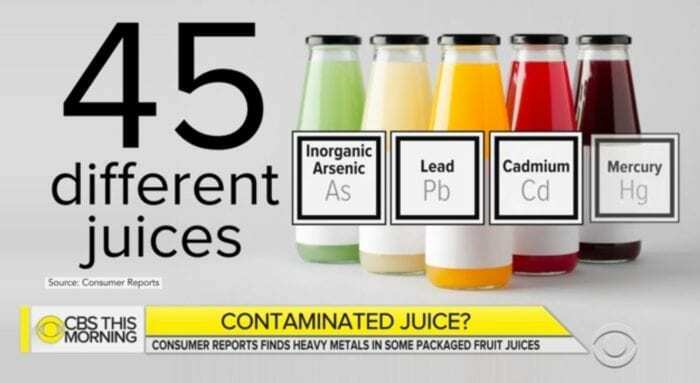 According to a recent Consumer Reports study, heavy metals were found in almost every juice brand out there. In fact, it’s disturbing AF to know that the very juices that your kids are drinking -including “healthy, 100% juice” juices- contain heavy metals. Remember the good ole’ days when our biggest concern about juice was how much sugar it contained? It’s a toddler’s worst nightmare: first the recent recall on chicken nuggets for wood and rubber contamination. Now juice is ruined, too. Stuff that kids love has the potential to genuinely hurt them, and that’s absolutely insane. This is a really scary problem for parents. The reality is if you’re buying your kids juice, it most likely contains a dangerous level of at least one heavy metal such as lead, arsenic, or cadmium. And what do these substances do to the human body? Let’s start with learning disabilities, mood swings, kidney problems, and -get THIS- certain kinds of cancer. Maybe you’ve been skipping the more sugary juice blend drinks in favor of “healthy” juice alternatives. You only buy organic brands touting their “100% juice!” promise. Well, your efforts have been in vain- 45 different juice brands all tested positive for at least one heavy metal in a study done by Consumer Reports… and several organic, family-friendly brands made the list, too. I bet many of those brands look familiar, don’t they? In fact, this photo includes EVERY SINGLE JUICE BRAND I’ve bought for my kids. And I thought I was doing a good thing by buying the more expensive, “healthier” brands. Apparently these very same juice brands were tested several years ago, and found to be in need of safety improvement. 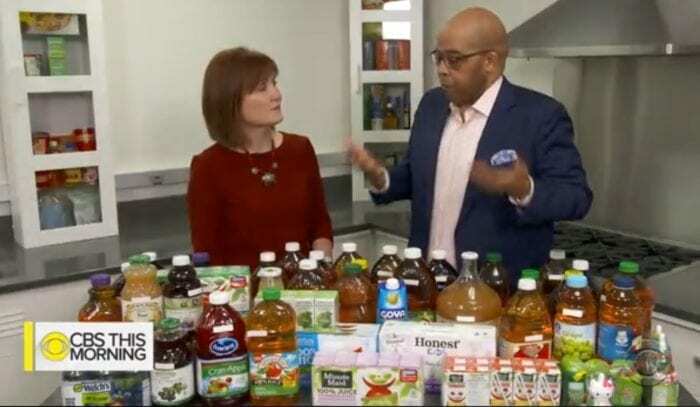 Improvements have been made since the juices were tested 8 years ago, but Consumer Reports still recommends parents give their kids less juice. Oh, ok. Great. Juice products were worse a few years ago, and even though they’re “better” than they were, they still contain potentially harmful ingredients. So have your kids drink less of the potentially dangerous, heavy-metal laden juice. Sure. Consumer Reports Chief Scientific Officer James Dickerson explained that heavy metals are found in minute quantities in the air, water & soil, but are also part of the manufacturing process. His team tested 45 different brands of juice for four key metals: arsenic, lead, cadmium, and mercury. Good news: there was no mercury detected. every single product contained a measurable amount of at least one heavy metal. So the juice box your child may have had with lunch today likely contained lead. You know, the very same lead that doctors test young children for, in case they’re accidentally eaten lead-based paint chips off the walls. While it seems crazy, lead ingestion can cause headaches, stomach pains, and behavioral issues- it’s enough of a concern that every child is tested for it. That lead is probably in your kid’s juice right now. Disgusting, isn’t it?? Or maybe you buy a brand that contains arsenic. You know, arsenic… the POISON, that causes fatigue, pain in bones & muscles, and raised blood sugar levels. Or maybe it’s cadmium, with symptoms including: headaches, dizziness, respiratory infections, and kidney problems. Metals found in 7 of the 21 samples have potential harm for children who drink only half a cup per day. A half a cup of juice a day is still exposing your child to “concerning amounts” of harmful heavy metals. That’s a damn small amount in a single day. But apparently it’s not small enough to not expose a small child to potential side effects. And dammit, that pisses me off more than I can express. Because as parents, we desperately want to provide what’s best for our children. We read labels. We choose products we believe to be reasonably healthy, or at least SAFE for our kids to consume. And it’s not enough- the very items that companies are marketing as “healthy”, “organic” and 100% real juice” are apparently anything but healthy. Has it really gotten to the point where we have to juice our own apples, gallons at a time, in order to keep our kids from harmful, potentially carcinogenic crap in their drinks?? If you’re outraged, parents, you should be. Granted, fruit juice doesn’t have the same health benefits that actual fruit itself does, but… kids should be able to drink fruit juice without toxins. If only sugar was still our worst enemy when it comes to kids’ drinks! Looking for a list of the brands has so called “lead” in the juice. So I know what NOT to buy for my 3 and 5 yr old. How about a list of juices that do NOT contain these nasty toxins? That might be a shorter list… ?